Shilpa Shetty with her well toned body is a stunner and she is right on top of her fashion game when she flaunts a saree. Many celebrities like Vidya balan, sonam kapoor, kajol and rani Mukherjee prefer to wear sarees for various events but what sets Shilpa Shetty apart is her ability to modernize her saree looks. 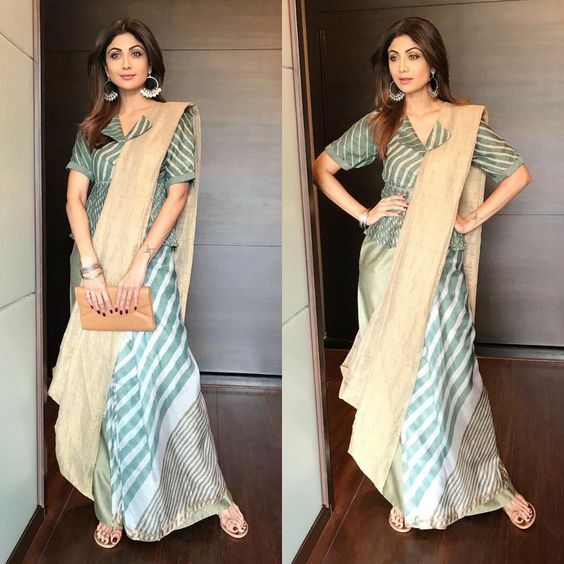 Shilpa Shetty tries to give an innovative spin to almost all her saree looks and can also be spotted in various contemporary fusion saree drapes like dhoti saree and sari gowns. Here in this post I bring to you 15 Trendy looks of Shilpa shetty in saree. Get set for some serious fashion Inspiration ahead of the festive season. Shilpa Shetty is a major saree trendsetter who has sparked off many trends like the sari gowns and striped or ruffled sarees. Another thing Shilpa Shettys gets right is accessorizing with sarees. Whether it is her earrings, flowers in hair or even a belt all come together seamlessly to enhance the elegance of her saree looks. Striped saree has become a raging hot trend after designer Sabyasachi popularized it in one of his latest collections. Shilpa however rocked the striped saree look long back pairing it with a trendy embroidered blouse from Qbik. The accessorizing was on point with cuffs and a pair of trendy earrings. Fringe is another hot trend which has been for a while and refuses to die down. Fringe dupattas and lehengas are everywhere but have tried the fringe saree yet? Shilpa shetty totally owns this concept pre-draped saree which has fringe pallu detailing. You can bu a normal fringe detail saree and drape it the normal way and it will still look gorgeous and festive. As for the styling make sure to keep it minimal and let the fringe be the highlight of your look. If silk sarees are what you are most drawn to then Shilpa shetty shows you how to style it in unique ways. Pair your silk saree with a full sleeve brocade blouse this winter and embrace the wedding season without compromising on your comfort. If you are looking to instantly glam up your saree look then try pairing it with an off shouldered blouse. But of course this kind of blouse design doesnt work with all body types. Try it ony if you have well toned arms and shoulders. Complement a saree look like this with statement neck jewellery to make it festive ready. If stylizing a saree with belt sounds interesting to you then take inspiration the diva who does it right. Adding a belt to a normal saree look gives a modern appeal to your attire. These belts can also help hold the pleats of your saree giving an edgy vibe. You can try different kinds of belts from leather to metallic or even fabric belts. You got to agree shilpa Shetty can work stripes and she works it like a dream. This striped saree with plain pallu is paired with an offbeat collared blouse and hoop earrings making for a graceful charm. These kind of saree looks can be flaunted at any office parties and semi formal events. Trust Shilpa Shetty to take something as traditional and classic as a kerala kasavu saree and add a modern twist to it. The whole off shoulder and flared blouse increases the ommph fator of this saree look and the green necklace lends a bit of colour making for an elegant winner. Plain sarees are super versatile and can serve as great canvas for creative blouse experiments. Here Shilpa Shetty pairs a floral blouse with plain saree and adds more visual delight with roses in hair and bold lip colour. Eye catching and beautiful. Rock any party in an embroidered cold shouldered blouse paired with simple or plain saree. Hair in bun and striking lips is all you need to make a statement at any wedding you attend. This sping time come alive beauty is my favourite shilpa Shetty saree styles. I love the print and the rulles combination which looks trendy, uber chic and oh-so-feminine. If you have a day time wedding to attend this fun saree is what you should try to replicate. You can pair it with sleeveless blouse, open hair and kadas. If you dont have flaunt worthy body then try a pain blouse with short sleeves and it should work equally well. Shilpa can get both traditional and modern right. Here she does a full on traditional look complete with waist belt and nose ring. So classic and pretty! Another version fringe popular these days is to have it on blouse sleeves. Off shoulder blouse sleeves feature metallic fringes which is best paired with sheer plain sarees for a delicate chic appeal. These kind of looks can be flaunted at wedding receptions or even dinner parties. Which of these Shilpa Shetty saree styles are you looking forward to try this festive season?